We offer our customers a wide range of styles and finishes for our fitted furniture. We deliver our own visions that balance beautiful bespoke design and incredible functionality all in one. 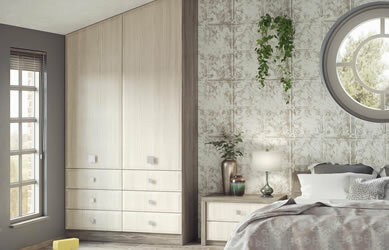 Integrity bedrooms – simply great advice and service you can trust. All bedrooms are now available in Veneer and Solid Wood finish. 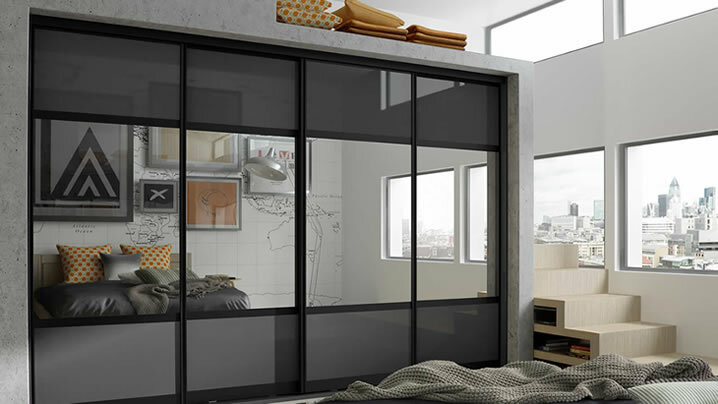 Fitted Sliding Wardrobes: Our sliding wardrobes use a superior quality track and frame system in combination with an unrivalled choice of panel options. 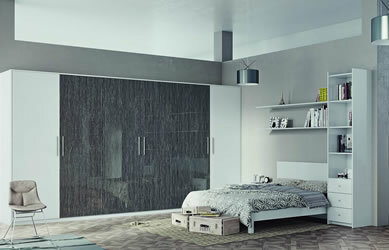 Ethos Fitted Bedroom Furniture: The visually striking and dynamic Ethos bedroom uses a dark pencil line finish in contrast to the Snow White Mirror gloss. 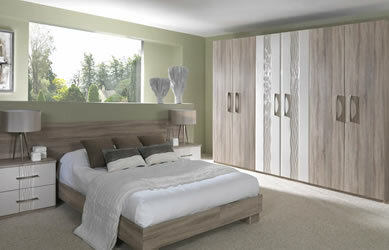 Simplicity Fitted Bedroom Furniture: The Simplicity bedroom range is perfect in a Gloss finish or in a solid colour. 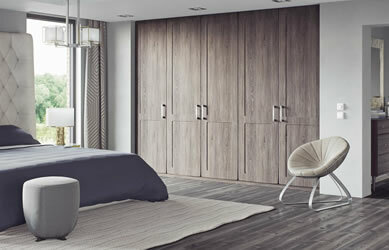 Grace Fitted Bedroom Furniture: The Grace fitted bedroom is a beautiful fitted bedroom with curvaceous scooped-out handles which give it a modern look with clean lines. Phoenix Fitted Bedroom Furniture: The Phoenix fitted bedroom is a designed with large double panels with hints of traditional style but with a use of ultra-modern materials and outstanding finish. 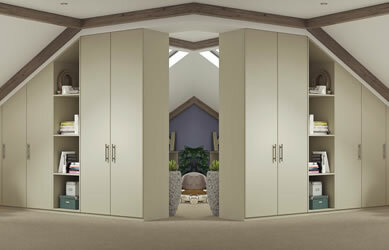 Peace Fitted Bedroom Furniture: The Peace fitted bedroom range is designed to create a bright and functional bedroom. The smooth edges of the Peace doors add to the soft and relaxing environment. 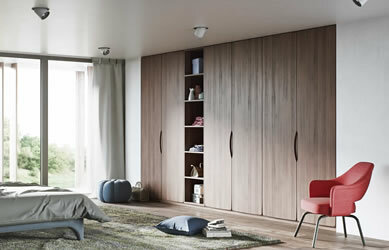 Serenity Fitted Bedroom Furniture: The dynamic vertical styling of the Serenity door is complemented beautifully by the door design and highlighted by the use of plain and light woodgrain. Elite Fitted Bedroom Furniture: Our painted doors open up a whole world of design possibilities, combining the flexibility of made-to-measure sizes with a choice of hundreds of paint colours. 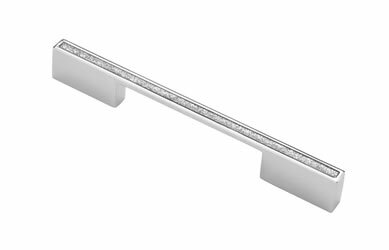 Handles & Knobs: We have hundreds of handles and knobs available for your fitted bedroom furniture. Contemporary or traditional. Many are shown here. Simply great advice and service. Integrity bedrooms create fitted furniture for West Midlands, East Midlands, Staffordshire, Shropshire, Gloucestershire, Worcestershire, Warwickshire and all surrounding areas. Simply choose a day and a time that suits you and one of our friendly and highly experienced designers will meet you in the comfort of your own home and help you choose the style of fitted bedroom furniture and accessories to suit your style and budget. Simply great advice and service. AMAZING! This company has provided us with two sets of wardrobes. The quality and end results of the products are absolutely breathtaking and a unbeatable quality. The company provided excellent service from design to fitting to products. Furthermore, the fittings of the furniture was extremely prompt and planned efficiently. I would highly recommend and will look forward to using Integrity Bedrooms in the future.